This splendid volume is a classic work on the military conquest of Scotland by the Romans. With its 51 attractive and detailed plates, complemented by 205 pages of supporting text, it recorded many new Roman remains for the first time, and 'as a storehouse of trustworthy topographical information regarding Roman sites, it can never be entirely superseded' (MacDonald, 1917, p.161). Indeed the early direct observations of Roy are still valuable today, especially for sites where more industrial, agricultural or urban change has occurred since. This is true in spite of the archaeological digs and aerial photography, particularly in the 20th century, that have led to many new archaeological discoveries. The book is also a lasting monument to a man whose enthusiasm as an antiquary was matched by his distinction as a man of science, and success as a military engineer and soldier. William Roy was a keen antiquary at a time when antiquarian research and publications were flourishing. 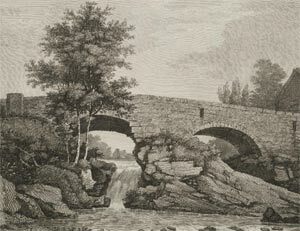 Alexander Gordon's Itinerarium Septentrionale (1726) and John Horsley's Britannia Romana (1732), both seminal archaeological works, enhanced the undersanding particularly of the Antonine Wall in Scotland, and were based not only on careful scholarly research but also on detailed observation in the field. Roy was fortunate in knowing Captain (later Lieutentant-General) Robert Melville, who in the 1750s was reconstructing Agricola's advance into Scotland, and from whom he learned several important details about Roman marching camps. Sadly, Roy's text was overly influenced by Charles Bertram's De Situ Britanniae, (1757) which was claimed to have been copied from a manuscript written by Richard of Cirencester, but was proved conclusively a century later to have been a forgery. Nevertheless, Roy's first-hand research, keen eye, and background in military engineering, gave his observations and surveys a lasting value. The analogies between the Roman conquest of Scotland, and the Hanoverian conquest of the 18th century, with which Roy was directly associated, gave Roy's antiquarian research a contemporary and very personal relevance. Roy was elected a fellow of the Society of Antiquaries in 1776, and the importance with which they regarded his work is reflected in the efforts they went to in publishing it after Roy's death.